The Big Idea: When your child isn’t feeling well, a doctor or nurse can give him the expert help he needs. Call the doctor’s office and explain what’s happening, along with any worries or concerns. Tell the doctor or nurse about your child’s medical history. Ask if you should go to the emergency room or to an urgent care center. Make a list of questions or concerns to bring up at the visit. Bring your insurance card, your child’s immunization record, a list of any medicines she takes, and your pharmacy’s contact information. Explain where you’re going and why. Let her know that the doctor and nurse can help figure out what is making her feel sick, and find a way to help her feel better. Bring a comfort item, such as a favorite stuffed animal. If the doctor prescribes medicine, make sure you understand how and when to give it to your child. Ask the doctor or nurse what you should expect and why you might need to follow up with a call or visit to the doctor. Pick up any prescribed medication, and ask the pharmacist any questions. Talk with your child about how you will take care of her, and how the medicine may help her feel better. 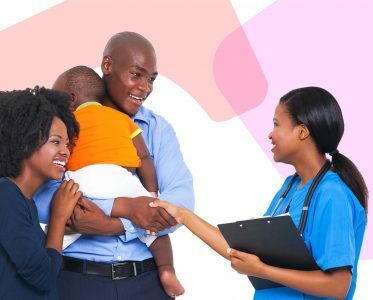 If someone other than you will be taking care of your child, share important information about medicines the child will have to take or symptoms to look for.